There’s something about weekend mornings and pancakes that’s just MEANT TO BE. I run downstairs like a five-year-old on Saturday morning, so super duper excited to brew coffee, get out the flour, and enjoy breakfast with the guy I love. Cooking really is a love language for me. Making food brings me a joy that nothing else does. It’s one of the only things I do regularly besides exercise where I feel completely locked in, undistracted, wholeheartedly present. I am forever grateful for the beauty that is creating and sharing a meal. For me, pancakes mean slow, comfy, cozy, snuggly, coffee-scented mornings. Being in the restaurant industry (especially with brunch being the beloved meal that it is), I go through long stretches where I spend Saturday mornings at Alchemy Grandview. Those mornings are lovely too, but more a lot more fast-paced, exciting, and complex. Having spent so many weekend mornings at the stores makes me deeply grateful for mornings I can now spend at home. When we’re in the thick of opening a restaurant, I can’t begin to imagine it functioning without me or the other owner being there all the time. And just like that, a stellar, trustworthy team falls into place, and it’s no longer dependent on us to function smoothly. It’s a beautiful process. Now let’s talk fluffy pancakes! There really shouldn’t be any other kind. I’ve been making pancake recipes for as long as I can remember, as evidenced by this hilarious pancake post I wrote in 2013. Oh and these Chocolate Chip Banana Pancakes and Apple Cider Pancakes (complete with a seasonal spider in the picture) from 2012. Archaic, right? We’ve come so far! I prefer my pancakes like sweet, warm little clouds—light and fluffy, satisfying, and packed with whole grains to keep me full all morning. 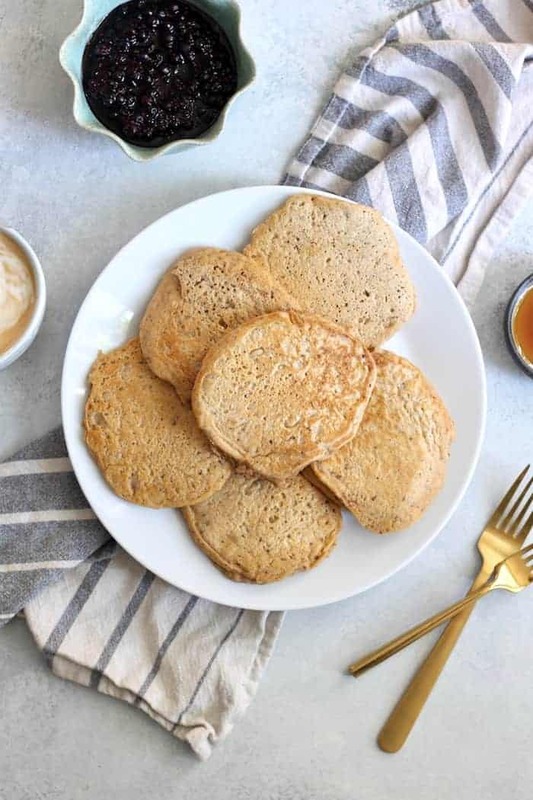 This recipe for Fluffy Vegan Pancakes has a full tablespoon of baking powder and a homemade “buttermilk” for extra fluff. But you need more than fluff when it comes to making pancakes that aren’t flat and gummy in the middle. Oh, I’ve been there. It’s a dark place. The trick to making perfect fluffy pancakes is threefold. 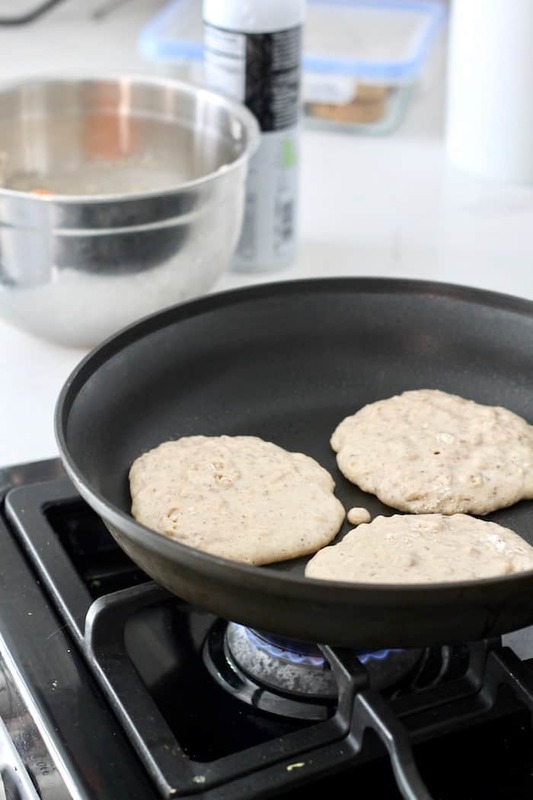 First, make sure your skillet is hot, but not scorching (we don’t want charred pancakes now do we?). For me, that’s just below medium heat. Second, make sure the batter is thick. A lot of recipes call for equal proportions of flour and liquid but I find a bigger flour to liquid ratio results in the fluffiest stack. Third, do not over-mix. Fold the wet into the dry gently and stop as soon as you don’t see flour. Clumps are warmly welcomed here. Now, which flour is the best flour? This whole wheat pastry flour is my go-to for pretty much all baked goods because its milled from soft white wheat and is lower in protein and gluten for softer, more tender baked goods. Whole wheat flour is milled with hard red wheat, is higher in gluten, and has a courser grind. It’ll work, but it’s not the best option for this Fluffy Vegan Pancakes recipe. All purpose flour would work great as well if you don’t care about the whole grain part. For the sweetener, you can use maple syrup, honey, or regular sugar. For the oil, I used my go-to avocado oil, but really any neutral oil works. I use a full teaspoon on cinnamon here because I freaking love it, but you can cut that in half or leave it out if it’s not your thang. Now if you’re not vegan or don’t have ground flax on hand, you can use a regular egg instead of the “flax egg.” You can also use melted butter instead of oil if that tickles your fancy. If you follow me on Instagram, you’ve seen my melty bloob topping a trillion times. All I do is dump a cup of frozen wild blueberries (get the three pound bag at Costco for the best deal) into a bowl and microwave them until all hot and bubbly. 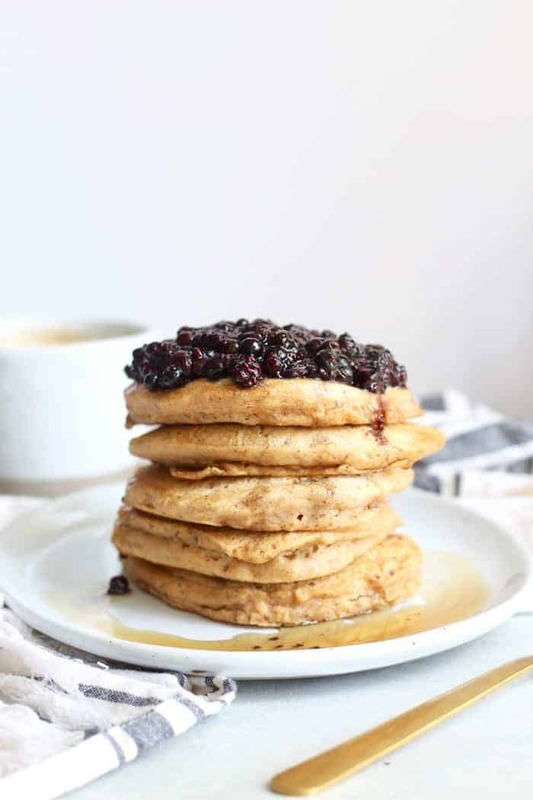 Add a splash of maple syrup and chia seeds to thicken and BOOM SHAKA LAKA you’ve got a splendid little pancake topping packed with brain-boosting, heart-lovin’, inflammation-fightin’ antioxidants. Free radicals, be gone! Add a swirl of drippy almond butter and a drizzle of maple syrup and dig your fork into greatness. Fluffy Vegan Pancakes, I love you long time. Add almond milk and apple cider vinegar to a liquid measuring cup. Set aside to curdle. In a medium bowl, stir together the flour, baking powder, cinnamon, and salt. To the liquid mixture, add maple syrup, vanilla, and flax egg, stirring to combine. Pour wet ingredients into dry, stirring gently to combine. Lumps are good! Do not over-mix. Heat a griddle or large pan over medium heat and coat with oil or spray (I use coconut oil). Once hot, add 1/3 cup of batter to skillet, repeating as needed. Cook for about 2-3 minutes per side and flip once bubbles start to form. Cook for 1-2 more minutes or until golden. To make blueberry topping, place blueberries in a small bowl and heat in microwave or on stovetop until hot. Pour back into bowl and stir in chia seeds and syrup. Set aside for 5 minutes to thicken before serving. 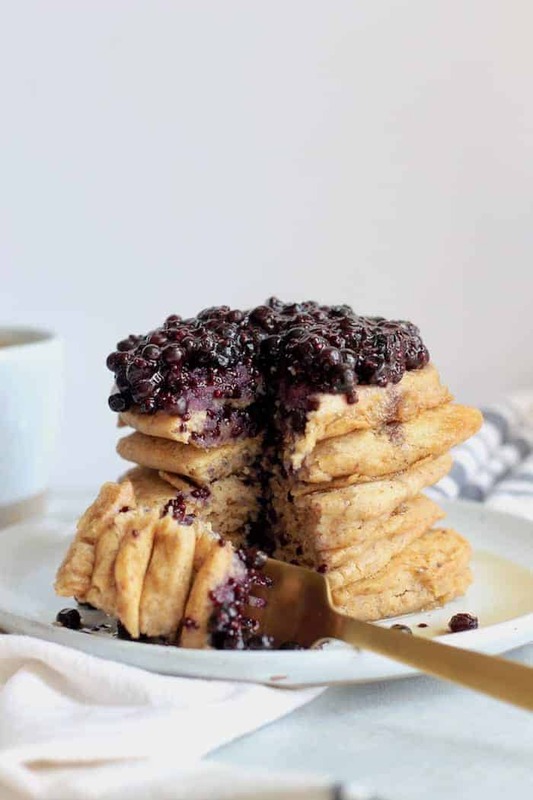 Top pancakes with blueberry mixture, almond butter, and maple syrup if desired! You can keep pancakes warm in a 200F oven if desired until ready to serve. Pancakes have long been one of my favorite foods to prepare, especially for others. This recipe sounds perfect for my new nutritional goals. While your blueberry mixture sounds spectacular!! (and I [will] try it), I feel compelled to share a favorite topping which I can hardly wait to try with these. You ready, it’s peanut butter and molasses, next will be applesauce and yogurt(non-dairy). Keep those marvelous posts coming Ma’am. hehehe, I’m glad you also call blueberries “bloobs”…I said it the other day and my friend was totally disgusted! I’ll be making these this weekend! I love when vegan pancake recipes don’t have mashed banana. I mean. I love banana pancakes but sometimes I just want a fluffy pancake and it’s hard to get them fluffy with a mashed banana in there. omg yaaaassss i’ve been waiting for this!!!! honestly i might make up early to make these one day this week before work because i can’t think of anything better than a fancy breakfast mid-week ;) thanks for sharing!! The food you make is very attractive, I love your food, it looks attractive. I totally feel you about Saturday mornings. They’re the best. Also, gimme a stack of these right now. YUM. HA — dying at those archived posts. Your photos and writing style have changed, but your recipes are still as delicious as ever! These look amazing! Do you have he nutritional info for this recipe? Nope sorry I don’t calculate nutrition info! I love weekends breakfasts too! And love the blueberry topping idea…I’ve made something similar before too and it’s DELICIOUS ? You need these in your life !! Just made this on a snow day and I couldn’t think of a better snow day breakfast. They were delicious, just the right amount of sweetness and super easy to make. Will be making these again! I’m so thrilled you enjoyed them, Athena! Snowy breakfasts are the BEST.